We loaded the car with bags, our pockets and hands with muffins, a bagel, a yogurt, and some juice and coffee from the breakfast bar. 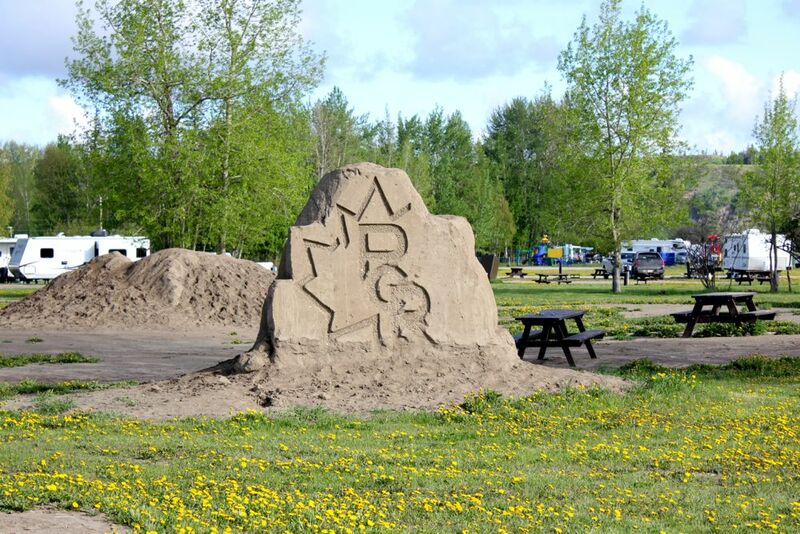 We backtrack some to see the Kiskatinaw Curved Wooden Bridge, but before we take our turn we stop at a campsite, with lodges and RVs, to look at the sand carvings left unattended and alone to handle the weather by themselves. There are images of bears, bulls, a setting sun, and a maple leaf with initials PGR for the Patriot Guard Riders. A few miles down the road is the bridge built in 1942. Though many were built for military use during World War II, this is the only one still in use. It curves nine degrees along its 534 foot length and took nine months to build. 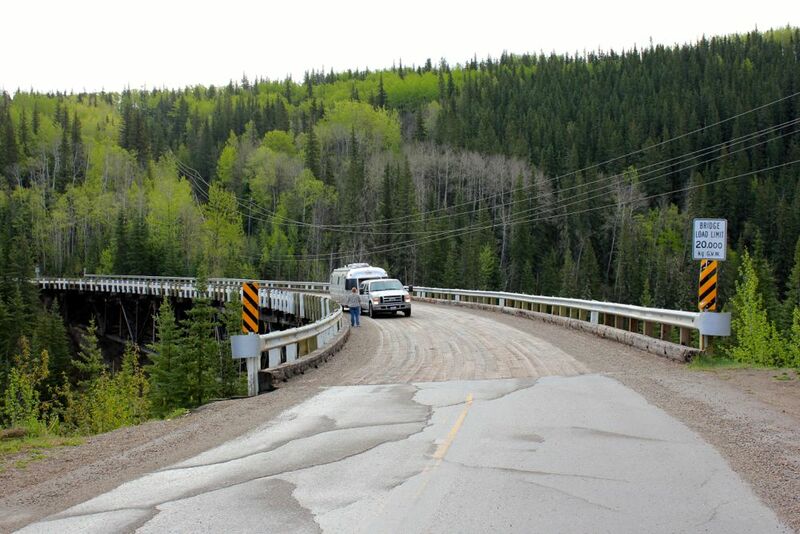 A new road was built in 1978 to bypass the bridge when oil and gas trucks exceeded its 25-tonne capacity. I love when history and modernisation can work together to show where we’ve been and where we’re going. We stop in Dawson Creek, partly to get gas, and partly because of the after-school special. I get a poppy-seed muffin with a field berry yogurt – such a delicious combo, while Caleb fills the car. British Columbia is gone in the blink of an eye and it will be our last time in this great province for a while. 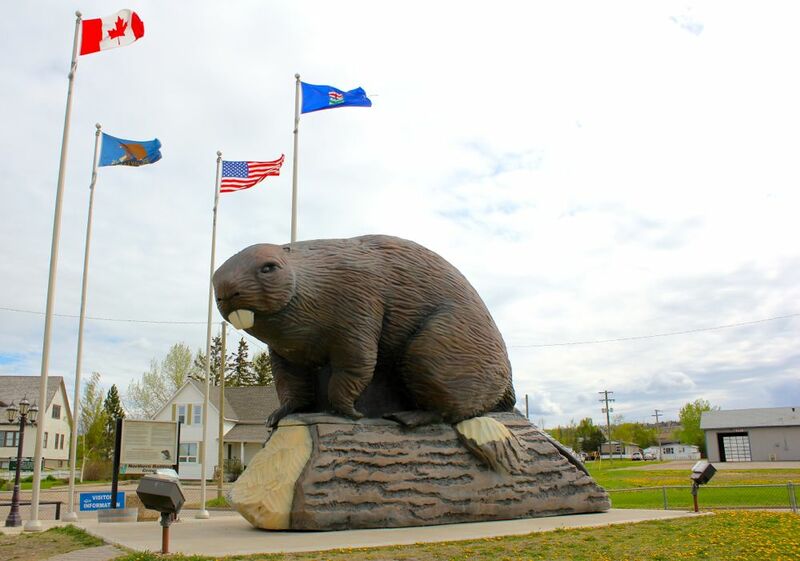 Alberta greets us and we stop to see the giant beaver built in 2004 to attract tourists for the town of Beaverlodge, settled in 1898, and named after the temporary dwellings of the Beaver Indians. Beaverlodge is home to Canada’s most northerly agriculture research station – meaning they grow a bunch of different things and see which methods work best and what seedlings can be mixed with others. Apparently the beaver is a distinct representative of what it means to be Canadian – hard-working, peace-loving, and haters of waste – and destroyers of trees. In 1985, one hundred beavers cut down 5,000 poplar trees, but did use them efficiently for food and home. We pulled over to play ball with Sparky in the grass along the highway before stopping in Edmonton to get gas. There was a boat in front of us and another in the parking lot getting filled with beer as a bunch of local kids, probably my age, prepared to go out for the day. I didn’t listen to what they said as much as I did how they said it. I love the local accent. Caleb went in to prepay and the attendant said he must be from British Columbia – no, we’re from that southern country that apparently has a problem with drive-offs too. We drive to the Royal Alberta Museum, but are too late to go inside. 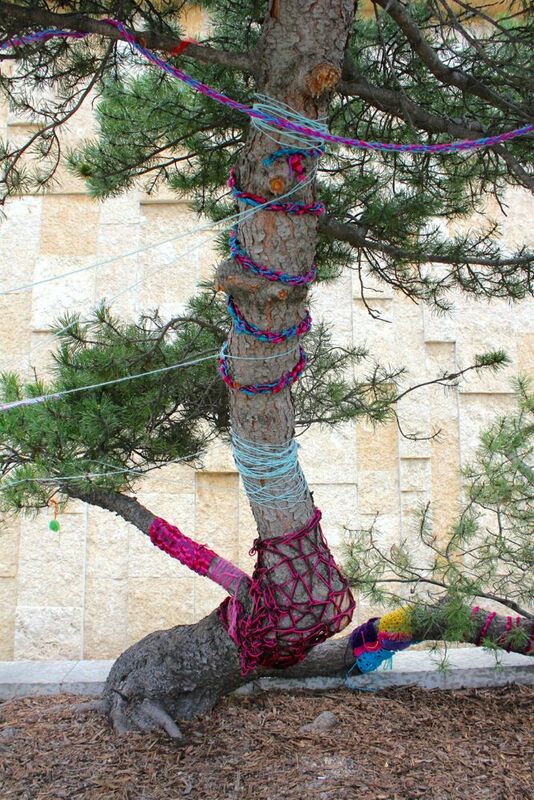 We can still walk around and see trees, bike racks, and stair railings wrapped in yarn – knitted designs,strings thrown on, and fluffy ornaments and pom poms. Down the stairs to a dirt path and we see runners, loving couples embraced, cyclists, walkers, and playing dogs. There’s a steep section that shows a view of the river, lots of park area, and more of the city on the other side. I want to spend more time in Edmonton. It looks like a neat place to spend three days walking around. There is so much to see on the outside of shops that I may get away with not spending too much money. The price should balance out with the exchange rate, but the eight cents that our dollar buys does nothing against the extra that they charge. While waiting at a light I try to get some pictures of the city – there’s too much and not enough time for it all, but I would recommend the trail that gives you a great view of the city center skyline before leaving town. 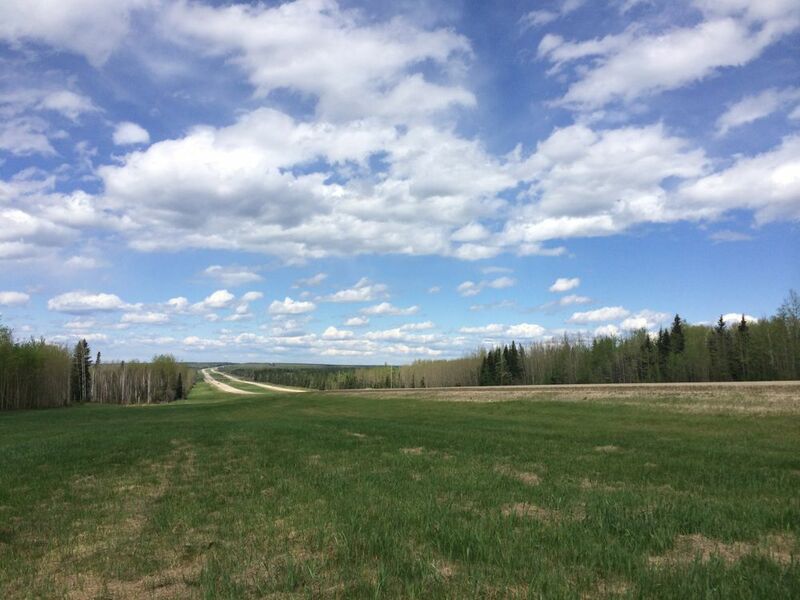 Driving south in the middle of Alberta and that moment comes when I think about driving north back to the Yukon and Alaska for a couple of months, but knowing I will continue to the States where bills, appointments, anxiety, surprises, and missing people await me. I want to remain in the cold weather among friendly people, good food, and poor cell reception. I want to get a pet bear and grow a garden that I only have to tend six months out of the year, but that will all have to wait as I mentally prepare for moving to the desert island of Bahrain in two weeks. We stop in Calgary at Pho Phuong Vi to share a bowl of vermicelli noodles with veggies and tofu. With a hot meal in us and the time change that we realize makes it 9:30 instead of 8:30 we stop in Nanton for the night. We are two hours away from the United States border that opens at 7am with museums and two national parks in-between that won’t open until hours after. Caleb sets the alarm for 5am. This entry was posted in Animals, Art, Fiber Arts, Food, History, People, Places, Plants, Travel and tagged Beaverlodge, Dawson Creek, Kiskatinaw Bridge, Pho Phuong Vi, Royal Alberta Museum. Bookmark the permalink.